Real estate continued to roll this week, leading the S&P 500 to within 1% of new record highs. REITs climbed for a remarkable fourteenth week out of the past fifteen. REITs pushed their 2019 gains to just shy of 20%, reaching the highest level in two and a half years. REIT earnings season kicks off next week with Prologis and Crown Castle. 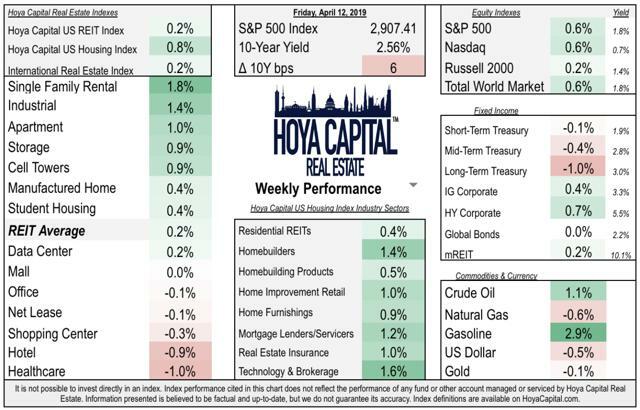 Not to be outdone, Homebuilders jumped another 1.5% on the week, leading the broader housing sector to another week of solid gains with an important week of housing data ahead. 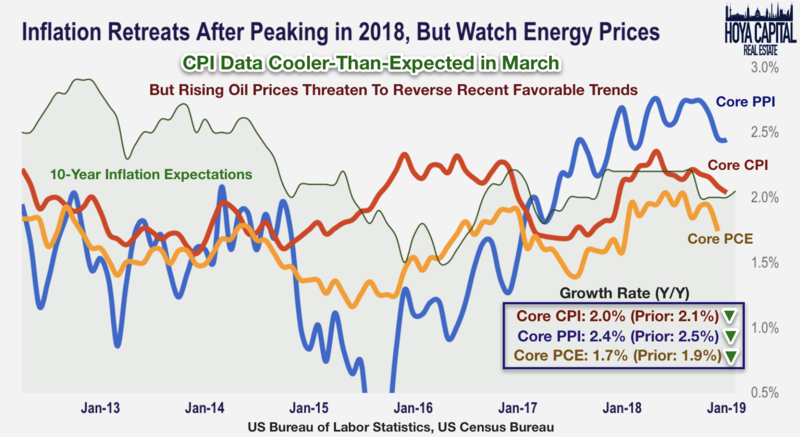 CPI data came in cooler than expected, but suddenly rising energy prices have become a threat to potentially derail the "Goldilocks" conditions that have powered the 2019 rejuvenation. The US labor market is relentless. Initial jobless claims hit a 50-year low this week and JOLTs data continues to show that there are more job openings than unemployed Americans. Stop us if you've heard this one before. 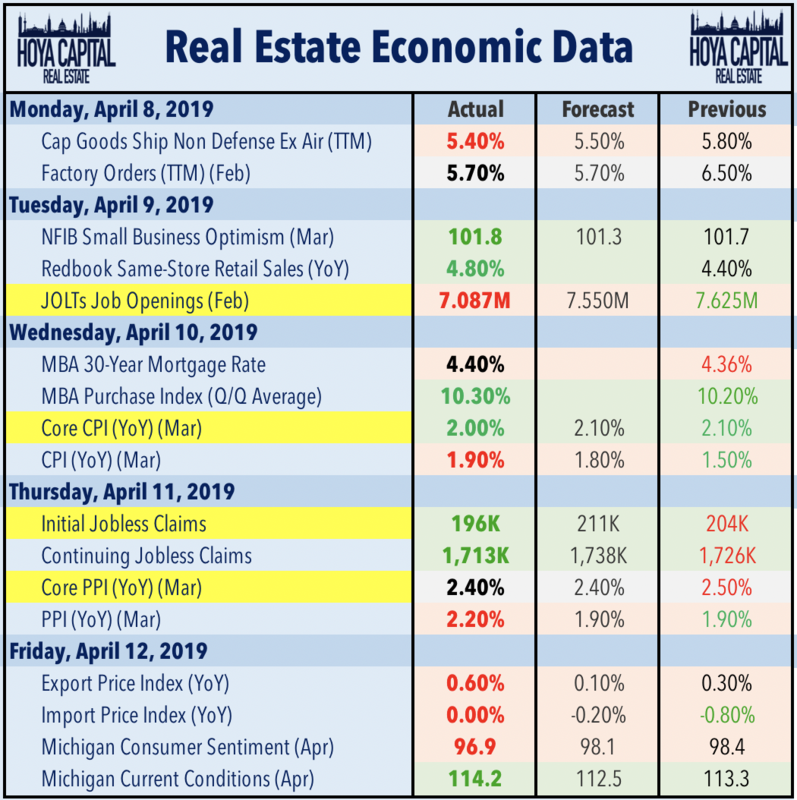 Real estate continued to roll this week, a common refrain so far in 2019 as "Goldilocks" economic conditions have rejuvenated the previously sputtering REIT and housing sectors following their worst year since the recession. A statement that would be hard to believe around Christmas-time last year with equity markets in bear market territory, the S&P 500 (SPY) and Nasdaq (QQQ) each gained another half-percent this week and are both back within 2% of new all-time record highs. REITs (VNQ) climbed for the fourteenth week out of the past fifteen dating back to early January, a remarkable run of performance that pushed the broader REIT index to the highest level since September 2016. REITs pushed their 2019 gains to just shy of 20% with earnings season kicking off next week. While CPI data was cooler than expected this week, interest rates crept higher again this week as rising oil prices are quietly threatening to upset the favorable macroeconomic environment that has powered real estate outperformance this year. Not to be outdone, Homebuilders jumped another 1.5% on the week, leading the broader housing sector to another week of solid gains. 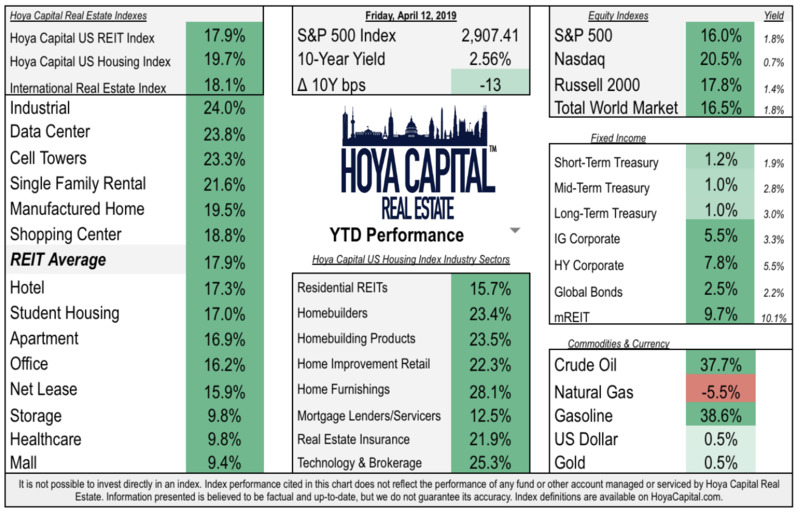 The Hoya Capital US Housing Index, a tier-weighted index that tracks the performance of housing and housing-related companies, climbed roughly 1% and is higher by 20% so far this year. Restoration Hardware (NYSE:RH), Trex (NYSE:TREX), Tempur Sealy (NYSE:TPX), At Home (NYSE:HOME), and Realogy (NYSE:RLGY) each gained more than 6% on the week. Among the laggards this week were Williams-Sonoma (NYSE:WSM), Wayfair (NYSE:W), Redfin (NASDAQ:RDFN), and Bed Bath & Beyond (NASDAQ:BBBY). An important week and a half for housing data begins next Tuesday with Homebuilder sentiment data. Housing starts and permitting data is released on Friday while New Home Sales data comes out the following Tuesday. Inflation was - and remains - the key threat to potentially ending the nearly decade-long economic recovery. Rising oil prices, along with rising costs from tariffs and trade disputes, had put upward pressure on inflation throughout 2018, pushing both the 10-year yield and 30-year mortgage rates to post-recession highs. The plunge in oil prices in late 2018, along with moderating global growth, has quelled much or all of that inflationary pressure. Core CPI declined to 2.0% in last week's release, Core PCE was cooler than expected, and Core PPI declined to 2.4%, in line with expectations. 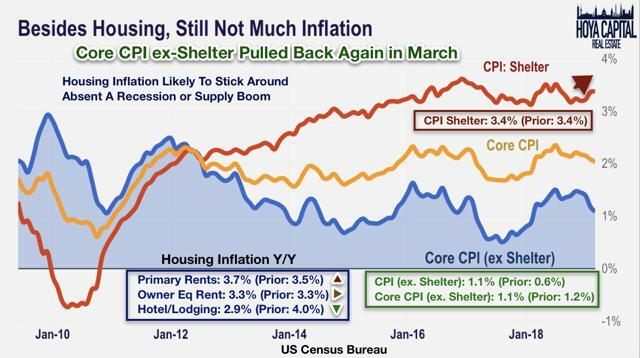 Housing (CPI:Shelter) accounts for more than a third of the total CPI weight (42% including housing-related services), and since 2013, housing inflation has been significantly above the overall inflation rate. From 2015 through late 2016, housing inflation was one of the only components keeping Core CPI out of deflationary territory. Housing inflation has reaccelerated over the last several months after moderating slightly in 2018. Consistent with recent data from Yardi and other third-party rent growth indexes, primary rent growth has picked back up to 3.7% YoY, significantly above the broader inflation rate of 0.6%. The importance of housing costs on the overall price index cannot be overstated. Since 1995, shelter inflation has outpaced the broader rate of inflation by more than 1% per year, fueled by a persistent supply shortage in the US housing markets. Over the last three decades, structural impediments to supply growth, aggravated by the dramatic dislocations during the housing crisis, have dramatically slowed the rate of housing starts per capita. On a rolling 10-year average, residential fixed investment as a share of GDP is the lowest since the end of WW2. 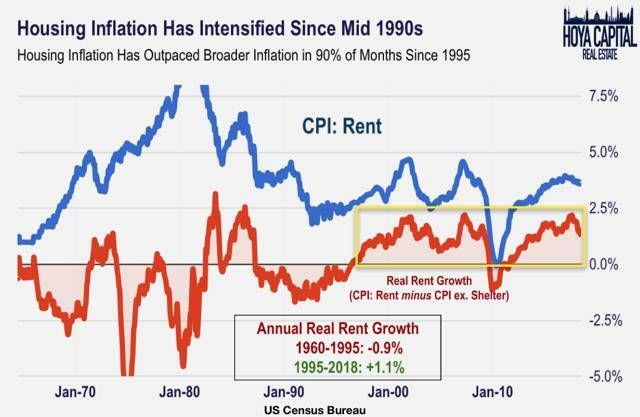 The implications of this housing shortage, we believe, will be a continued persistence of "real" housing cost inflation and a long runway for growth in residential housing construction in order to equalize the supply/demand imbalance. We continue to believe that the impact of oil prices and the US dollar on both headline and core inflation data is underestimated in consensus expectations. Just as economists seemed to miss the pullback in inflation this year, we think that investors should be prepared for hotter-than-expected data if oil prices continue to creep higher. Oil prices remain 15% below their October 2018 peak, but are up 45% from December 2018 lows, and turned higher on a year-over-year basis this week. 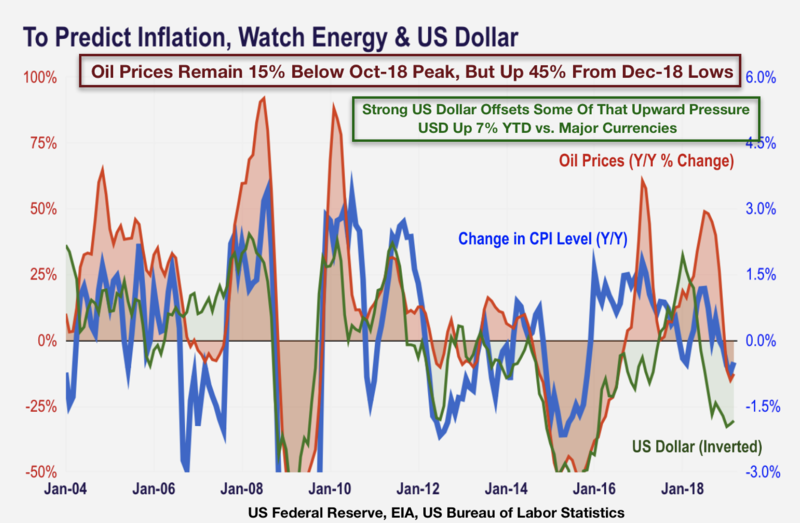 A strong US dollar should offset some of the upward pressure, but investors can no longer bank on the positive tailwinds holding back inflation data and inflation expectations. 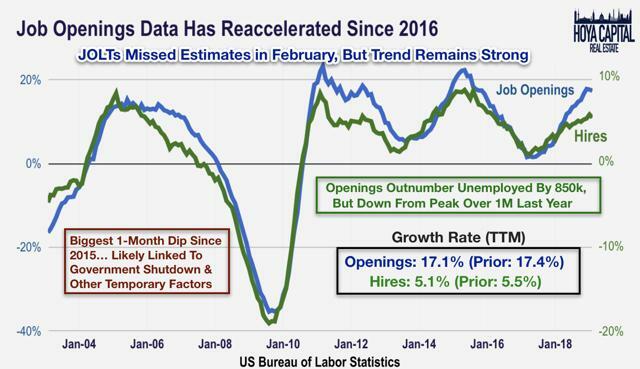 Evidence of broad-based strength in the labor markets continues to show across nearly all metrics as job growth remains relentless, defying expectations of many economists that have called for a slowdown in hiring and "full employment" for the past half-decade. 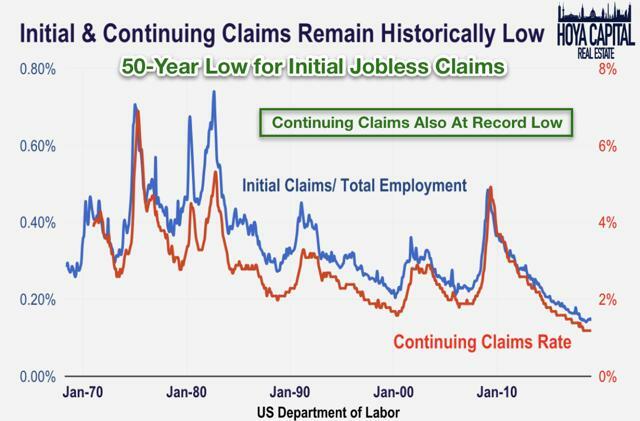 This week, initial jobless claims reached the lowest level in nearly 50 years. Adjusted for the size of the labor force, initial claims have been in record-low territory for much of the past three years, as have the rate of continuing claims. 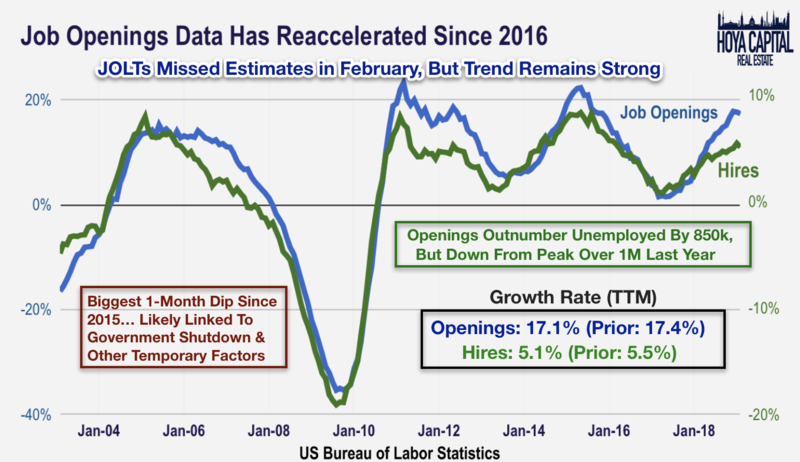 JOLTs (Job Openings and Labor Turnover) data released this week was mildly disappointing, however, reflecting the slowdown in hiring noted in the February nonfarm payrolls report before bouncing back in March. On a month-over-month basis, job openings dipped the most 2015, but remain higher by more than 17% on a trailing-twelve-month basis. Hires are higher by 5.1% over the last year, as the number of job openings continues to outnumber the total amount of unemployed Americans in the labor force by more than 850k. 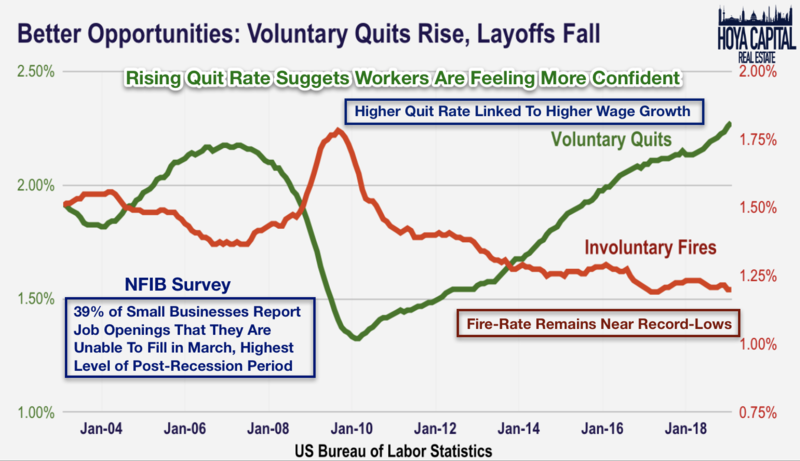 The rate of voluntary quits continues to rise, a sign of increased labor market dynamism and an indication that workers are feeling more confident about their financial situation. The lack of labor market dynamism in the post-recession period has been blamed for weak productivity growth and there is hope that the uptick in the quit rate may foreshadow future productivity gains as workers pursue jobs that better maximize their skills. Despite several announced layoffs that are given extensive media coverage, the rate of involuntary layoffs remains near record lows. So far in 2019, REITs have climbed by roughly 18% on a price basis and closer to 20% on a total-return basis. Homebuilders have surged by more than 23%, bouncing back after their worst year since 2008 for each sector. The S&P 500, meanwhile, has climbed 16% on the year while the small-cap Russell 2000 has jumped 18%. At 2.56%, the 10-year yield has retreated by 13 basis points since the start of the year and is roughly 70 basis points below peak levels of 2018 around 3.25%. This week, we published Industrial REITs: Not Tired of Winning. Since the start of 2016, no major real estate sector has outmatched the performance of industrial REITs, outperforming the broader REIT index by a cumulative 45% during this time. 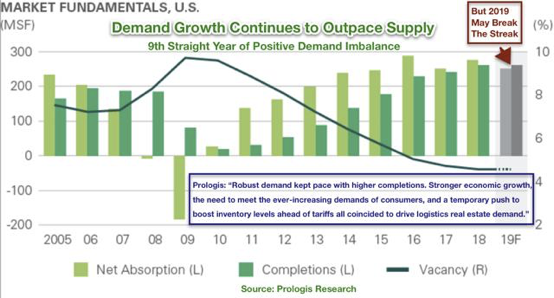 Rents grew another 8% in 2018 according to Prologis (NYSE:PLD) as demand once again outpaced supply, the ninth consecutive year of a positive demand imbalance. 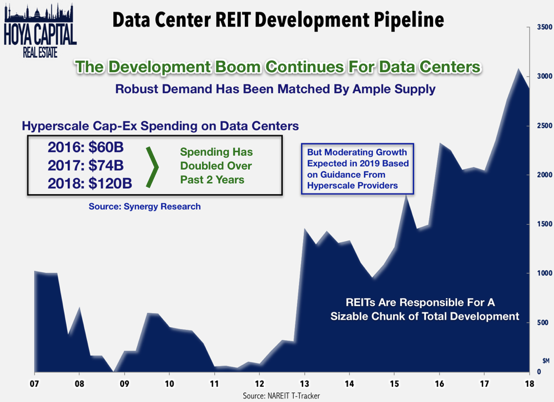 We also published Data Center REITs: Big-Tech Looms Over Cloud Boom. Data center leasing smashed records in 2018, jumping more than 30% for data center REITs, powered by a nearly 50% surge in capex spending from hyperscale providers. A concern for investors, the competitive landscape is quickly shifting as these "big tech" hyperscale providers are increasingly dictating the terms of the still-symbiotic relationship between REITs and their tenants. Finally, we also published Mall REITs: Catch A Falling Knife. The bifurcation between top-tier and lower-tier mall REITs continues to widen. 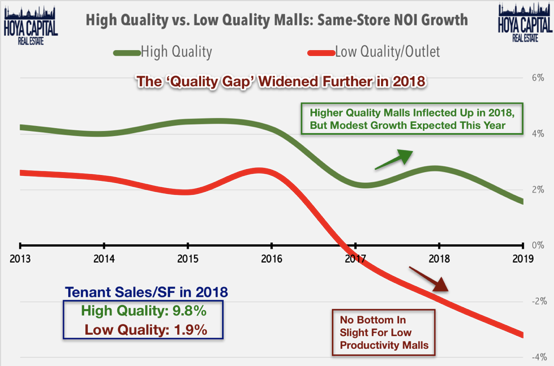 Store closings remain elevated in low-productivity properties and the outlook for these malls remains grim. For high-productivity malls, however, the metrics are stronger than the stock performance suggests. Occupancy remains around 95% and leasing spreads averaged 10% in 2018 as the long-term outlook remains solid. Real estate continued to roll this week, leading the S&P 500 to within 1% of new record highs. REITs climbed for a remarkable fourteenth week out of the past fifteen. REITs pushed their 2019 gains to just shy of 20%, reaching the highest level in two and a half years. REIT earnings season kicks off next week with Prologis and Crown Castle (NYSE:CCI). 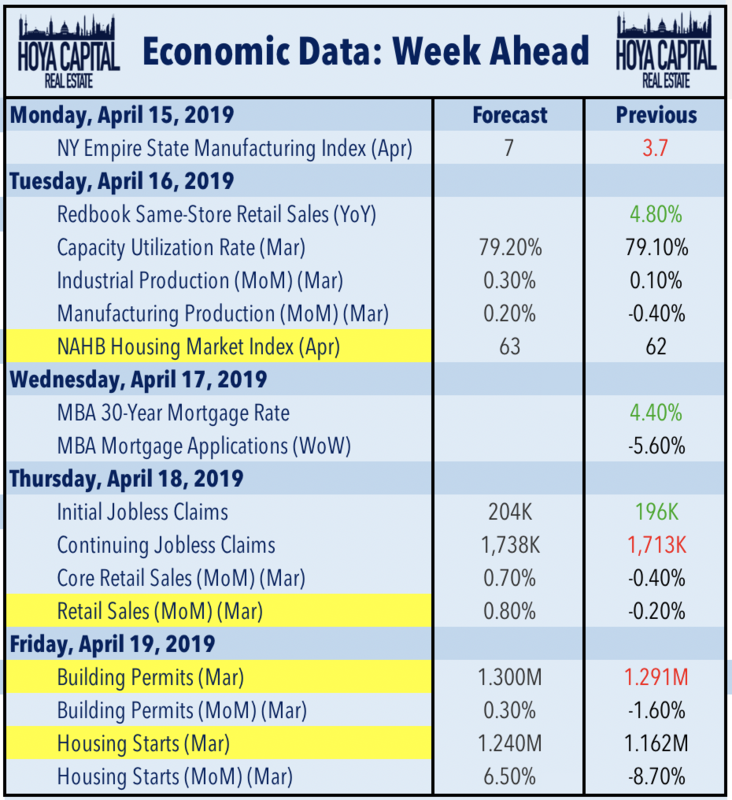 Not to be outdone, Homebuilders jumped another 1.5% on the week, leading the broader housing sector to another week of solid gains with a big week of housing data ahead. 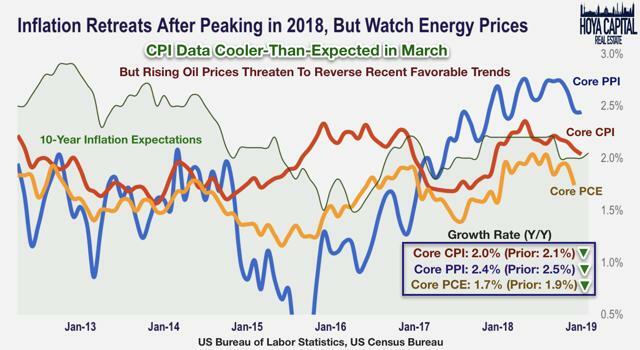 CPI data came in cooler than expected, but suddenly rising energy prices have again become a threat to potentially derail the "Goldilocks" conditions that have powered the 2019 rejuvenation. The US labor market is relentless. Initial jobless claims hit a 50-year low this week and JOLTs data continues to show that there are more job openings than unemployed Americans. 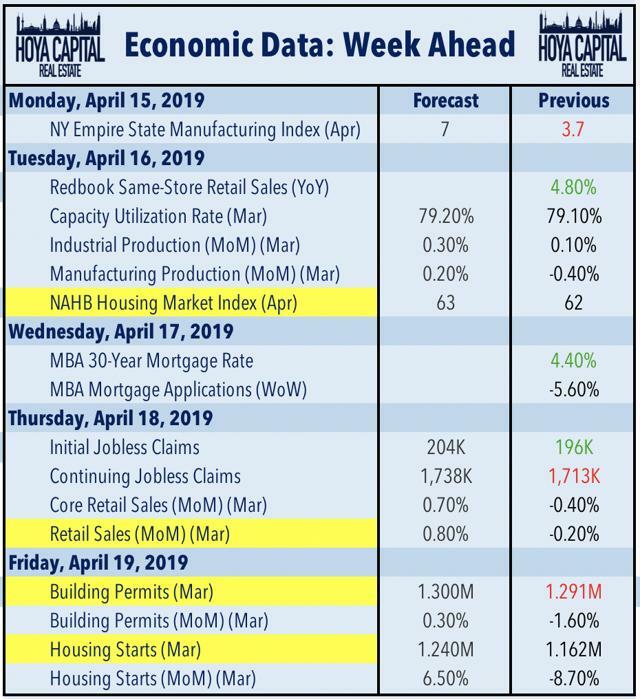 An important week and a half for housing data begins next Tuesday with Homebuilder sentiment data. Housing starts and permitting data is released on Friday while New Home Sales data comes out the following Tuesday. Retail sales, which is released on Thursday, rounds out a fairly busy week of economic data. If you enjoyed this report, be sure to "follow" our page to stay up-to-date on the latest developments in the housing and commercial real estate sectors. For an in-depth analysis of all real estate sectors, be sure to check out all of our quarterly reports: Industrial, Data Center, Malls, Net Lease, Manufactured Housing, Student Housing, Single-Family Rentals, Apartments, Cell Towers, Manufactured Housing, Shopping Centers, Hotels, Office, Healthcare, Storage, and Homebuilders. Disclosure: I am/we are long VNQ, RH, TREX, TPX, HOME, RLGY, JPM, BECN, CLGX, DHI, SSD, WSM, W, BBBY. I wrote this article myself, and it expresses my own opinions. I am not receiving compensation for it (other than from Seeking Alpha). I have no business relationship with any company whose stock is mentioned in this article.